1. You can reset your password by clicking the Forgot Password? link. 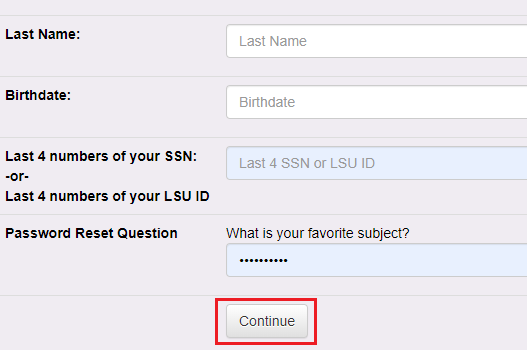 Enter your myLSU ID, click Continue, enter the required personal information for verification, and then click Continue. 2. On the next screen you will be asked to enter your PAWS ID or LSU email adress. Click Continue when finished. 3. You will then be asked to enter your last name, date of birth, the last 4 digits of your SSN or LSU ID, and an answer to your password reset question. Press Continue once complete. (*Note: If you have not set a password reset question for your account, you will be prompted to do so). 4. You will then be asked to input a new password fitting the requirments above the input. Select Change Password to create new myLSU password. 5. 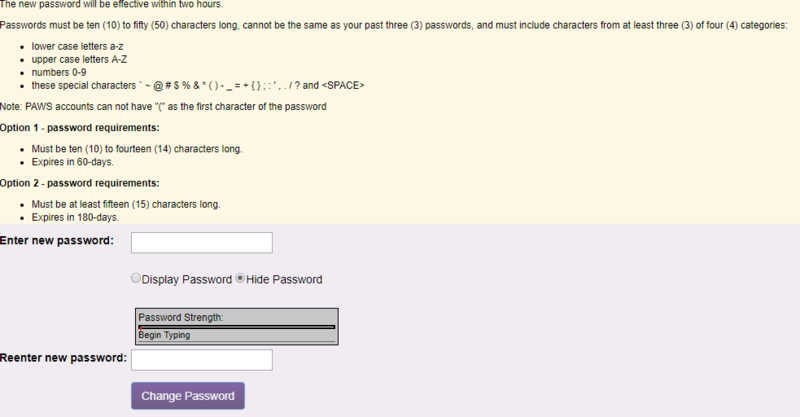 Once you have created a new password, please wait 2 hours before trying to log back in to LSUMail. Clearing out your cookies and cache during the wait can often solve issues when signing in, as this ensures that there is no previously stored data for a site that might cause issues. You can get instructions on how to clear this data by visiting the article Web Browsers: How to Clear the Cache. Users who have set up security questions but are unable to answer them correctly MUST visit the Service Desk. The account owner MUST bring a photo ID to one of the Service Desk locations on campus for assistance with resetting the password. NO PHONE CALLS WILL BE ACCEPTED REGARDING PASSWORD INFORMATION, AND NO PROXY INDIVIDUALS WILL BE HONORED. NOTE: Account Lockout Policy: After the third failed login attempt, the system initiates the policy. The user will be temporarily locked out of the account for 30 minutes. After this, the user can regain access to the system by signing in again. If you need further assistance, please contact the Service Desk at 225-578-3375 or itservice@lsu.edu.